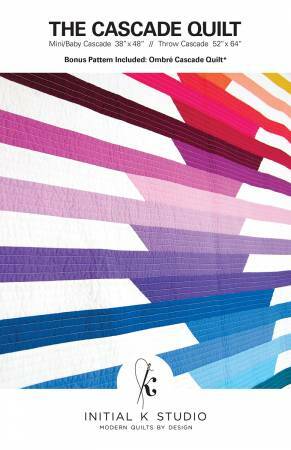 The Cascade quilt pattern is designed using Robert Kaufman’s Kona Cotton Solids 2014 New Colors—32 new colors in total. When designing the quilt, the main goal was to showcase the various color-ways in a simple, but dynamic way. The jellyroll friendly pattern includes measurements, easy-to-use instructions, and quilt diagrams to create your own Cascade Quilt in mini/baby or throw size.